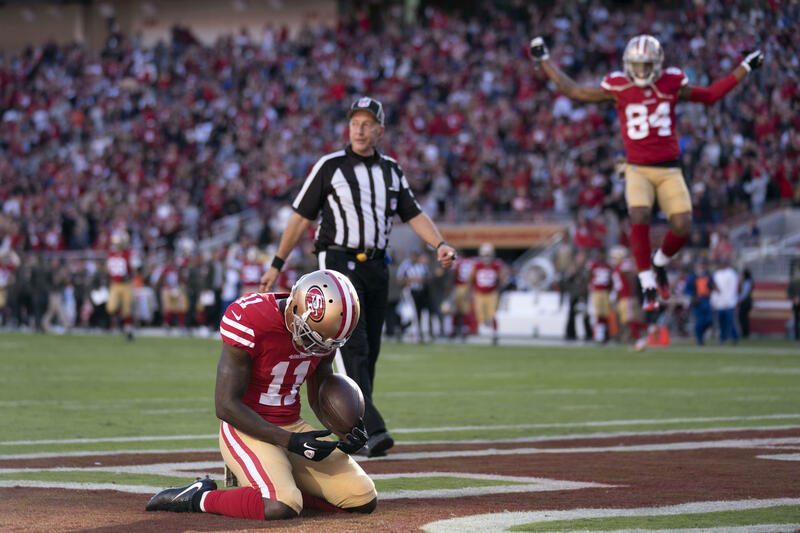 San Francisco 49ers wide receiver Marquise Goodwin was extremely emotional on the sideline after a long touchdown catch Sunday. After the game, it became clear just why. Goodwin said on his Instagram page that his wife, Morgan Goodwin-Snow, lost their baby boy due to complications during pregnancy early Sunday morning. "Although we are hurt, I am grateful for the experience and grateful that God blessed me with a wife as courageous and resilient as Morgan," Marquise Goodwin said on Instagram. "The pain (physically, mentally, & emotionally) that she has endured is unbelievable. Please Pray for the Goodwin family." Quarterback C.J. Beathard connected with Goodwin on an 83-yarder that was the team's longest TD pass in 12 years and contributed to San Francisco's first win of the season. As Goodwin ran into the end zone, he blew a kiss to the sky. He then sank to his knees and made the sign of the cross. While he rested his head on the grass, several teammates knelt by his side. Before the game, Goodwin was one of three players who took a knee during the national anthem. He and safety Eric Reid protested for the 49ers while defensive end Olivier Vernon was the only Giants player to do it. No one else kneeled during the afternoon games on Veterans Day weekend.